Run Bike & Forging Fitness: 01-12-13 Saturday: Hike and Bike in the 70s! 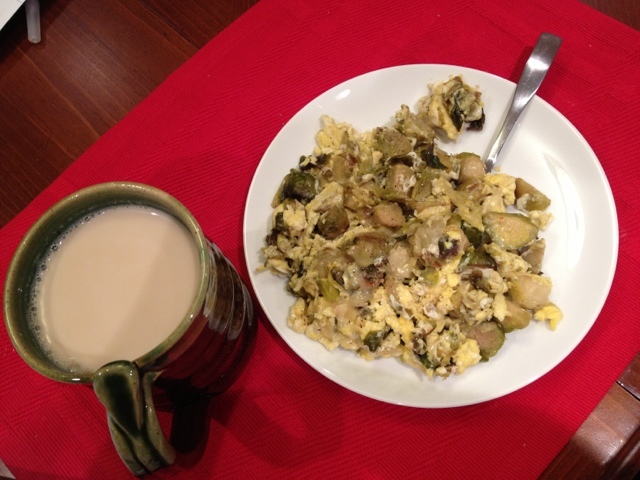 Breakfast of champions: chai (no sugar) and 3 scrambled eggs with 1 cup of roasted brussel sprouts. My eating habits are still not great but I did finally realize that if I eat 3 scrambled eggs with some vegetable for breakfast (instead of 2 eggs), I'm not hungry again for a good 3-4 hours. So my routine this past week has been to saute 1 cup of chopped organic brocolli and then scramble 3 organic eggs for breakfast. It was amazing how full I felt and I didn't feel the need to chomp on something until lunchtime. This morning, I decided to mix it up and substituted roasted chopped brussel sprouts for the brocolli with my 3 eggs and found that I wasn't hungry for over 4 hours. 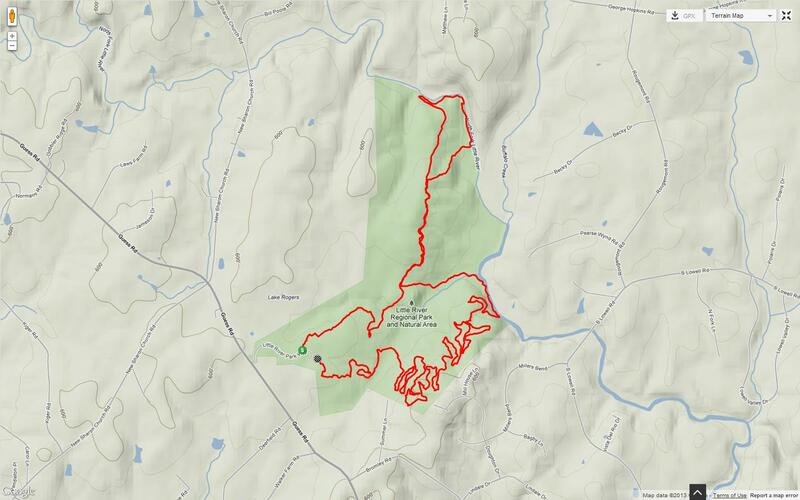 This helped since I did a 3 hour hike (8 mile) hike with a friend at Little River Regional Park. I have not been to this park since the 10 miler trail race back in January 2012! The same race is happening again on January 19th, but I didn't sign up and don't have any intention of running 10 miles anytime soon. As far as hiking the same trail- this was a great day for it. Conditions were slightly muddy but not too bad and the weather was perfect. At some point, I should come out here again and bike the trails - if it ever stops raining on Fridays and Saturdays. 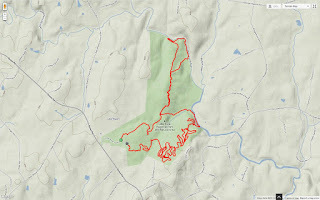 I went back home, ate lunch and checked the trail status around the area and saw that Harris Lake was open (most trails were closed because we had a downpour yesterday). So I got ready, loaded my bike on the car and headed out for a ride at Harris Lake. I only did 1 lap around (~7.5 miles) but it felt good to get out there. 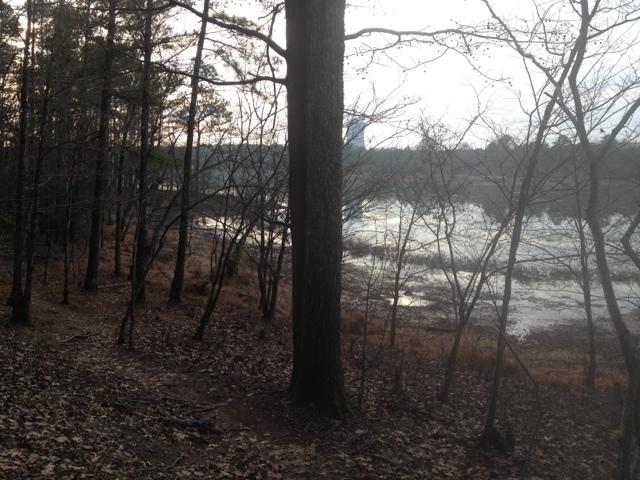 And for the first time, I noticed the cooling tower across the lake, it helps there are still no leaves on the trees. The weather tomorrow is again slated for 70° weather so I will be investing a lot time outside and savoring this warm spell. Harris Lake is a gift from the nuclear power plant!